The LUXEON V2 is a Chip Scale Package (CSP) based high power domed LED and available now from RS Components, is optimised for directional applications. 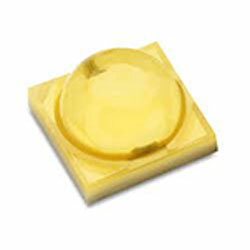 The LED delivers high efficacy and robustness in a 3535 package with three-stripe footprint intended to accelerate time to market by matching the radiation pattern of the company’s TX while enhancing system costs through unparalleled performance (flux and efficacy) at higher drive currents. The LED is aimed at applications in the architectural, high bay and low bay; outdoor stadium, street and area lighting arenas.